150 years ago this month, California Governor Henry Haight signed an act envisioning for the nascent Golden State a great public university. It would be, its founders imagined, a “people’s college” that would provide the children of farmers and factory workers with the kind of education they had previously only dreamed about. Beyond this, it would be a hub of knowledge and discovery that would serve California’s economy and enable the state to flourish. There is no doubt that this institution — the University of California — has far surpassed even these lofty goals. In the years since 1868, it has grown from 40 students on a small campus in Oakland to 10 university campuses educating nearly 300,000 student — not to mention five medical centers, three national labs and an extensive network of educational, health and agricultural resource centers serving Californians across the state. It has become what the New York Times called an “upward-mobility machine,” providing scores of low-income students with the means to improve their socioeconomic status, as well as one of the most incredible engines of research and knowledge production that the world has ever known. Yet the road has never been easy. 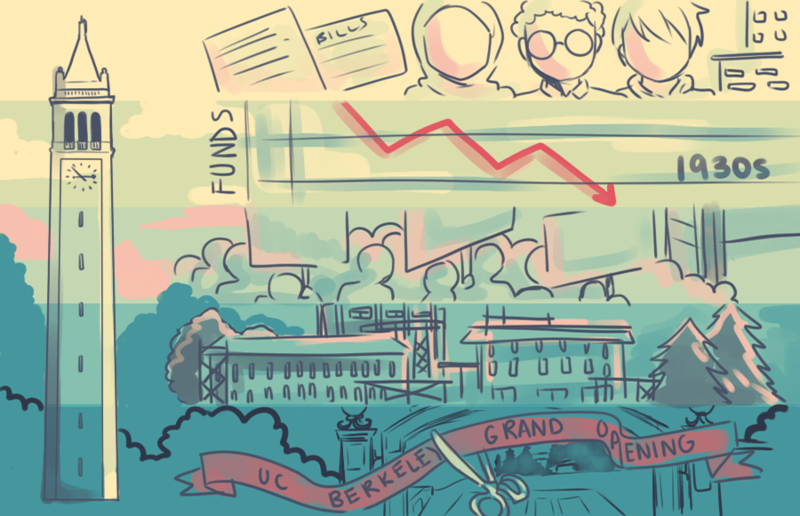 The history of the UC system is rife with examples of the university encountering major challenges and overcoming them through creativity, courage and grit. In the early years of its existence, for instance, California’s strong agricultural industry attacked the UC for not focusing solely on the needs of farmers. Fortunately, a passionate group of supporters managed to broker a deal that kept the university’s broader academic offerings intact. Later, in 1923, the first major urban wildfire in American history destroyed hundreds of buildings here in Berkeley and caused a quarter of the university’s faculty to lose their homes and research materials. But collections were rebuilt, and the community banded together to support those who lost houses. Then, during the Great Depression, an incredible 25 percent of the university’s state funding allocation was withdrawn, and the university had no substantial private gifts to fill the gap. Through vision and determination, the institution’s academic departments still managed to grow in size and stature during this time. From these early struggles through later ones such as the Loyalty Oath controversy and the unrest of the 1960s, our community has confronted more than its share of trials — which is why I know we can do it again. Today, UC Berkeley faces challenges that are as existential and complex as any we have navigated in the past, and we must be steadfast and vigilant in our stewardship of this remarkable institution. Today’s challenges are myriad. Most pressingly, we must create a new financial model for a public institution that is no longer supported by the state as generously as it once was. We must develop solutions to the governance challenges that have historically hurt the campus in terms of decisiveness, transparency and its ability to adapt and evolve. We must become more diverse — more representative of the changing population of California — in order to serve our mission, retain public trust and be a “people’s college” for the 21st century. There is also the challenge of the student experience. We have become a much bigger university than was ever imagined even 20 years ago, so how can we ensure that, at this scale, students thrive? Some of the issues here are fundamental: Unless we greatly expand our housing stock, how can we even ensure that students are able to live near their campus? To address some of these concerns, I recently inaugurated a strategic planning process that will examine what our university should look like in 10 years and the course that will take us there. Several committees of faculty, staff, students and administrators are even now studying these concerns and preparing a report, which will be released this summer. In my time as chancellor, I’ve been thinking a lot about the qualities that define our particular character and history. Intellectual courage is one of the most important — whether in the Free Speech Movement or the quest to discover new scientific paradigms. We strive to foster that courage — the constant questioning of the status quo — in our students, empowering and educating them to change the world as we have been changing it since 1868. Now, we must have the courage to make changes at home, changes that will put UC Berkeley on solid footing as we take it into the next 150 years. We are on the right track: We are making excellent progress in reducing our deficit, we have committed to doubling our housing capacity in the next decade, we are on the cusp of adding capstone discovery experience to every student’s education, we are hiring immensely talented faculty, and we continue to house amazing academic departments and to lead the way in research into genetic engineering, smart prosthetics, 3-D printing and so much more. Only by working together, looking to the future and committing to our core values of comprehensive excellence and access for all, will we maintain the brilliance of UC Berkeley. Here is to our next chapter. Carol Christ is the current chancellor of UC Berkeley.